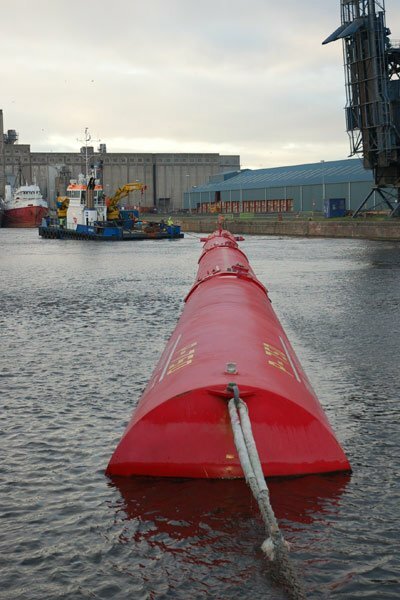 Ocean Power Technologies Inc. (OPT) has reached two major manufacturing milestones in the development of the company’s PB150 PowerBuoy, a wave energy converter that is to be ready for deployment at the European Marine Energy Centre (EMEC) in Scotland by the end of 2009. The mechanical elements of the power take-off system of the PB150 have been completed. OPT has also awarded Isleburn Ltd. the steel fabrication contract for the PowerBuoy structure. Isleburn is an Inverness, Scotland-based fabrication and engineering company for offshore structures. Once the steel fabrication is complete, the 150-kW PowerBuoy will be fully assembled and ready for deployment by the end of 2009 at EMEC, where OPT has already secured a 2-MW berth. When the PowerBuoy has been fully demonstrated at EMEC, OPT intends to deploy further PB150 PowerBuoys in projects around the world at locations including Reedsport, Oregon; Victoria, Australia and Cornwall, U.K.
Aquamarine Power has signed a $2.7 million contract with Fugro Seacore to install their wave energy generator, the Oyster, at the European Marine Energy Center. 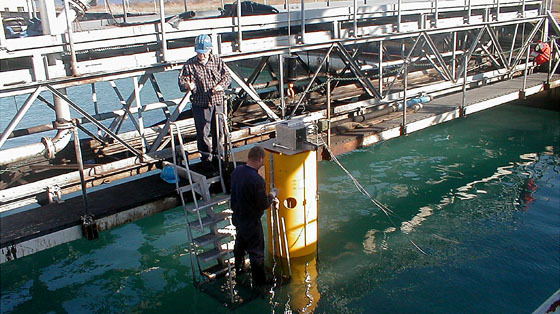 Aquamarine’s Oyster converter is designed for waters that are from 26-52 feet deep with anticipated installation 550 yards offshore in the second half of 2009. The Oyster has a wave action pump sending pressured water in a pipeline to an electricity generator. The generator, to be built in Orkney, Scotland, is expected to produce between 300 and 600 kilowatts for Scotland’s national grid. The contract is part of the Scottish government’s goal to derive 50% its electricity from renewable energy sources by 2020. In the United States, permitting may be an even bigger hurdle to marine energy deployment than financing. Between 25 and 35 different U.S. federal, state and local regulatory agencies claim some jurisdiction over marine power deployment. In the UK, two agencies handle permitting. Today, we can certainly say, “Yes, the time will come.” The only question remaining is how long it will be before humankind routinely and widely uses electricity generated from the kinetic power of ocean tides, currents and waves. If one defines “commercial ocean energy” as several tens of megawatts, the world cannot yet boast a commercial ocean energy installation. Indeed, only two installations of either wave, tidal or in-stream current devices are grid-connected and can generate over 1 megawatt (MW) of power. 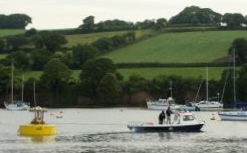 One is Pelamis Wave Power’s 2.25-MW Aguçadoura project off of Portugal’s northern coast and the other is Bristol-based Marine Current Turbines’ (MCT) SeaGen, a US $20-million commercial-scale tidal-energy project under development in Northern Ireland’s turbulent Strangford Narrows. In December, SeaGen boasted the first tidal turbine to hit a capacity of 1.2 MW. The rest of the world’s wave, tidal and current installations, some of which have been in the water as far back as the 1990s, are experimental and prototype units ranging in size from 35 kilowatts (kW) to 400 kW. Because these units operate only intermittently and are not typically connected to any grid, it is not possible to determine their total power generation. Many of these units are prototype demonstration units for the much bigger installations that are under development and that will begin to realize significant exploitation of the world’s ocean energy resource. For example, Ocean Power Technologies Inc. will use the 150-kW PowerBuoy it has been testing since the mid-90s as the “workhorse” for the 270-MW, four-site wave energy plant off California and Oregon coasts that it has partnered with Lockheed Martin to develop, says CEO George Taylor. And Inverness, Scotland-based WaveGen expects to use 40 units of the 100-kw turbine it just installed off the Island of Islay for a 4-MW farm off of Scotland’s Isle of Lewis. Meanwhile, Pelamis says if its 750-kw “sea snake” devices, which were installed last year, make it through the winter, it will put 37 more of them in the water, generating 30 MW. All of the wave, tidal, ocean and river current power around North America that can be practically extracted could together provide 10% of today’s electrical consumption in the U.S., says Roger Bedard, ocean energy leader at the Electric Power Research Institute (EPRI) in Palo Alto, CA. He adds that the total water resource could, it is sometimes said, possibly power the world twice over, but a lot of it is out of reach. “Hudson’s Bay, off the Arctic Circle, has HUGE tidal power, but it is thousands of miles from where anyone lives. We have HUGE wave resources off Aleutian Islands, but the same problem,” he says. See EPRI’s U.S. Offshore Wave Energy Resource Map, below. What will be the “magic” year for large-scale ocean energy deployment? Most developers indicate 2011-2012. Trey Taylor, co-founder and president of Verdant Power, which is moving into the commercial development phase of its 7-year-old Roosevelt Island Tidal Energy project, says the firm aims to have “at least 35 MW” in the water by the end of 2011. Verdant’s Taylor expects greater initial success in Canada. “The fundamental difference between Canada and the U.S. is that the underpinning of processes in Canada is collaborative and in the U.S. it is adversarial. It’s just the nature of Canadians, collaborating for community good, whereas in the U.S. people are afraid of being sued,” he said. Bedard says the U.S. could catch up to Europe earlier, if the Obama Administration walks its big renewable energy infrastructure investment talk. “But if it’s business as usual, it could be later, depending on the economy,” he says. Since the global economy began to melt down last September, many ocean energy companies have had to refocus their investment plans. With venture capital and institutional monies drying or dried up, firms are turning to public funds, strategic partners such as utilities and big engineering firms, and angel investors. In November, MCT retained London-based Cavendish Corp Finance to seek new financing. Raymond Fagan, the Cavendish partner charged with MCT, said although tidal energy is not as advanced as wind or solar, he has seen a “strong level of interest so far from large engineering-type firms in MCT’s leading position.” Because MCT holds patents and is delivering power to the grid ahead of its competitors, Fagan thinks Cavendish can bring it together with such strategic partners. In addition to the economic climate, he notes that the drop in oil and gas prices is further slowing renewable energy investment decisions. “Six to 12 months ago, people were leaping into renewable energy opportunities,” he says, adding that the UK government’s recent call for marine energy proposals for the enormous Pentland Firth zone north of Scotland will improve Cavendish’s chances of getting financing. Though it has yet to make a public announcement, MCT is widely viewed as a prime operator for the zone. Monies are still available. Witness Pelamis Wave Power’s infusion of 5 million pounds sterling in November, which it says it will use for ongoing investment in core R&D and continuing development of its manufacturing processes and facilities. In the U.S., permitting may be an even bigger hurdle to marine energy deployment than financing. Between 25 and 35 different U.S. federal, state and local regulatory agencies claim some jurisdiction over marine power deployment. In the UK, two agencies handle permitting. Bedard notes however, that streamlining the process in the U.S. may have begun with the recent opening of a new six-month process for licensing pilot marine energy plants. Marine energy experts agree that there are more opportunities for wave power than for tidal, as there are simply fewer exploitable tidal sites. In technology terms, however, tidal turbines have benefited from a quarter century of wind turbine development, says Virginia Tech professor George Hagerman. Despite more widely available wave resource, wave energy developers face the challenge of needing many more devices than do tidal energy developers, and have a higher cabling cost to export the power.